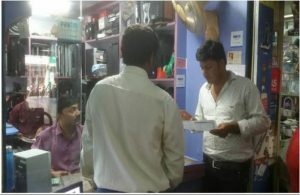 On 20 June, 2017 we have organized two programs among Dealers and Manufacturers of electronic items as a part of campaign against E-waste in Indore City. In this program we have received support from, Arunodaya Lok Kalyan Samiti (local NGO) and it’s Director Shri. K.G.Vyas along with his staff. First program was organized from 1.00 PM-3.00 PM at Godown premises, Novalty area and second program (manufacturers) was organized at Industrial area, Palad at 4.00 PM. Approximately 35 dealers having electronic item’s shops in nearby townships and 30 small / house hold level manufacturers and assemblers of electronic goods such as local LED bulk assemblers, electrical and electronic item assemblers were participated in the program. Lecturers, discussion, Poster exhibition were organized as mode of communication and awareness creation. They were explained to how to properly manage the electronic waste and need of safe management of electronic waste. The participants were shown happiness towards this program and assured their full support.